Metadata is information that describes specific aspects of an article such as the creation date, modified date and social sharing text. Canvasflow presents only 'channel specific metadata'. Only metadata that is relevant to the currently selected publishing channel is shown, helping ensure that only relevant meta information is requested. From the edit toolbar within the article manager, click the 'Metadata' button. The metadata panel will be displayed. Add the required meta information and click OK to apply the changes. 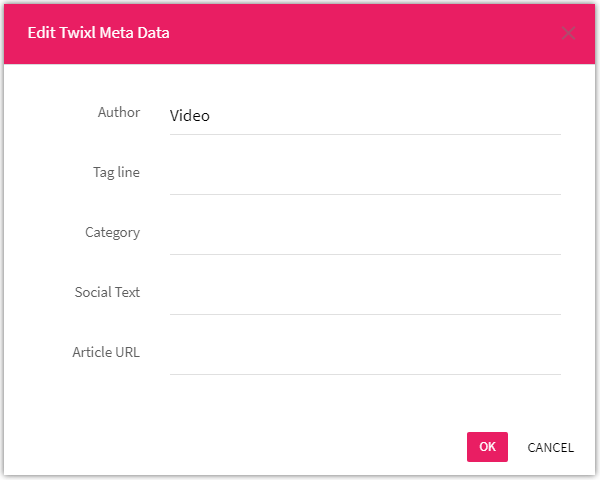 All changes to meta data will automatically be synced with the Twixl distribution platform, there is no need to publish the article. Metadata options are not displayed for articles when a publication is not connected to a publishing channel.